In today’s volatile and polarizing environment, brands often find themselves in the crosshairs. Whether a victim of an errant tweet or called to the carpet for a POV on any number of current events, CEO’s and their organizations are facing a new level of scrutiny. Expectations of speed, authenticity, and relevance can make decision making difficult. Take a stand or sit it out? Do the risks outweigh the rewards? For brands with a broad and varied consumer base, polarization in society can lead to paralysis in the C-Suite. A growing and highly influential segment of the population – the CorpSumers – are proving brands with a blueprint for bravery and action amidst the uncertainty. CorpSumers are consumers who believe that a company’s reputation is as important as the products it sells – and they act accordingly. From the products they buy to the investments they make and their choice of employers, CorpSumers expect Companies to help solve the biggest issues facing society. In short, they expect brands to take a stand on public policy and societal issues. They will reward you when you do, and remind you when you don’t. MWWPR’s second annual study, entitled CorpSumers on the Rise, demonstrates that this group of influencers is growing more powerful, as 35% of the US Adult population now identifies as CorpSumers—a rise of 2% in just one year. 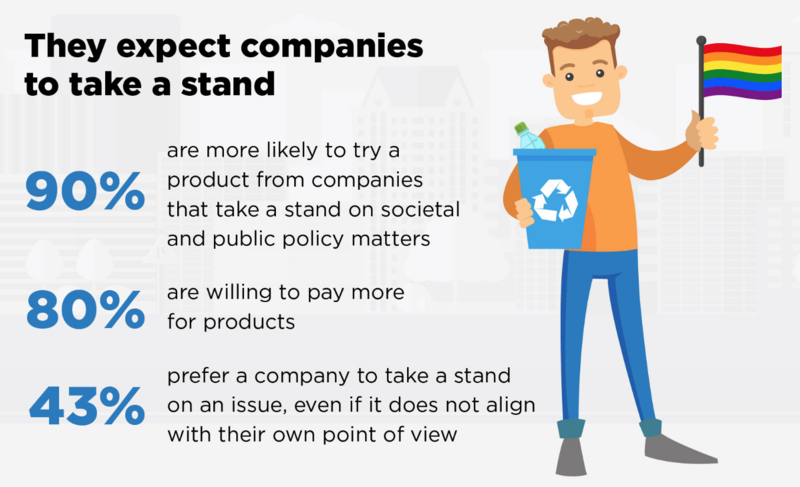 And our research shows that 80% of CorpSumers are willing to pay more for products from companies that take a stand on public issues. While brands have already been tapping into the rise of the more principled consumer, brands beware: “goodwashing” has become the new greenwashing when not executed with sincerity. Our research shows that 59% of CorpSumers remain skeptical of underlying corporate motives, making authenticity a non-negotiable. The media-savvy CorpSumer knows the difference between brand bravery and bravado, and is quick to recognize when corporations make a superficial swipe at “doing good.” In exchange for their brand loyalty and advocacy, CorpSumers expect consistency, authenticity, and accountability in a company’s ethos, message, and execution. Over the next few weeks, we will delve further into the findings of the study, examining the CorpSumer’s priorities and analyzing the authenticity of brands taking a stand. The insights in our new report demonstrate what types of engagement resonate most with CorpSumers, and armed with this data, MWWPR is uniquely positioned to advise brands on how to take an authentic stand and pioneer with purpose in this new brandscape. To learn more about CorpSumers, you can access the data from the study here. To dive deeper into the world of the CorpSumer, you can contact me at cwinters@mww.com.